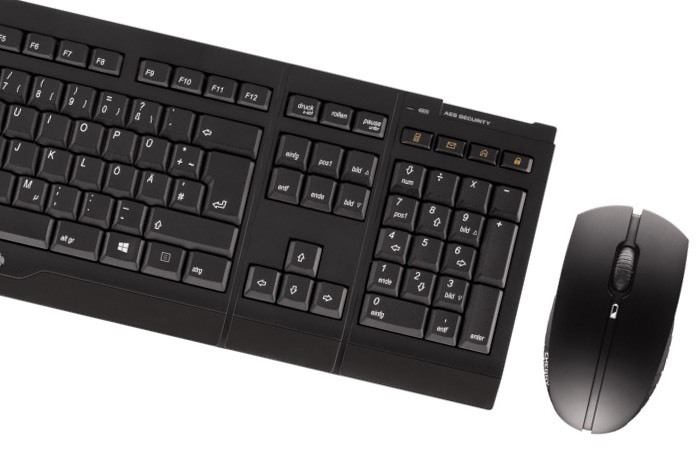 If security is high on your feature list for hardware peripherals you might be interested in a new wireless keyboard and mouse combination set that has been released by Cherry this week, who have equipped their new wireless hardware with 128-Bit AES Encryption. The 128-Bit AES encryption is used over the hardwares wireless protocol and if you are at all concerned about your business communications or details being sniffed while in transit from your keyboard to your PC system the new peripherals may well be worth more investigation. Cherry as always provides a robust wireless keyboard and mouse within the encryption bundle and have equipped their new keyboard with Cherry SX switches that are rated to last up to 10 million keystrokes, together with a mouse that is expected to last upto 45,000 hours. Unfortunately no information on pricing or worldwide availability has been released as yet by Cherry for their new wireless 128-Bit AES encryption keyboard and mouse set, but as soon as information comes to light we will keep you updated as always.